Good Day, Regular People: What's Christmas Like When You're Allergic to Evergreens? THanks, Ms. A. It is beautiful. We were lucky to find it. You're "fake" tree is way more gorgeous than our "real" one. Pretty tree. Done well (which yours is), a faux tree can fool even the most staunch real tree advocate (my mother in law). Oh, well, MIL or not, I can't. Itchy, coughy, burning eyes, the whole rotten mess. Your tree is full of heart and love...and that's the "real" Christmas spirit! Aw, thank you, friend. Merry Christmas to you! Thanks for stopping by this year, I appreciate it. Your Christmas tree is beautiful-- so tall and regal looking. Glad you found an allergy solution that looks so great. Thank you! Imagine, my kids not as thrilled as I was when I discovered it! THanks, Elaine. Merry Christmas to you! My sister-in-law's mother-in-law (wow! holy hyphens!) is also terribly allergic to evergreen and since she visits them every year for Christmas, they cannot have a real tree. As in "one grown in the ground." You are the first person besides Patsy (that's my sister-in-law's mother-in-law's name!) I've heard of who suffered like this. It may be a compromise for the non-allergic family members, but wow does it make a difference. Enjoy an itch-free, beautiful holiday with your beautiful family and your beautiful tree. It's as real as the love that assembles it. Wow, I have always thought that I was the only person in the world with evergreen allergies. I get deathly sick, can't breathe, throat & eyes swell, hospital er visit sick. I was near de a th sick every Christmas until I was around 10 years old. 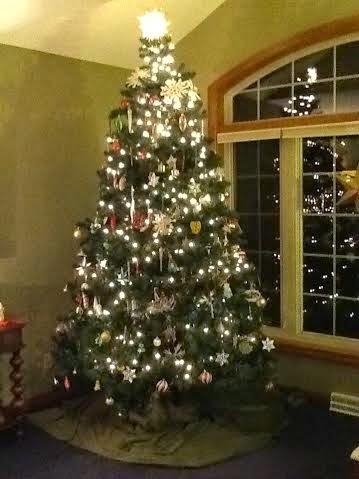 My family will never forget the evening that we were all quietly enjoying our tree & we thought that my Dad had lost his mind. He jumped up, flung open the front door, unplugged the tree & threw the completely decorated tree out the door in the midst of a lot of crying & screaming. He cleaned the entire house, opened the windows to let the fresh freezing air inside & I started improving immediately. Nobody in my family has ever had a live tree since & I have never been sick like that again for Christmas. I've had tons of people think that I was stretching the truth over the last 50 years & this is the 1st time that I've ever heard of another person with evergreen allergies. Thank you for sharing this!